After 42 years of Super Bowls featuring coaches who all fit the same mold, consider another barrier broken down by Steelers coach Mike Tomlin. Last night he became the first ever suave coach to win a Super Bowl. Prior to this, no Super Bowl winning coach had any modicum of coolness. Even Tony Dungy, the first black coach to win a Super Bowl two seasons ago, could not technically be considered cool what with his advanced age, constant charity work, and dedication to Christian principles. Past winners like Parcells, Gibbs, and Coughlin were exemplary coaches, but resembled most of America’s grandfathers and probably smelled like a library full of eggs. Now for the first time, America has an incredibly charming and engaging dude in his mid 30’s as the coach of their Super Bowl winner. Tomlin, or Black Fonzi as he’s been called, has not earned the distinction without controversy; many argued that former Buccaneers coach Jon Gruden could be considered suave. Before a ruling could be made, Gruden was witnessed purchasing a John Tesh CD, thus disqualifying him from the discussion. 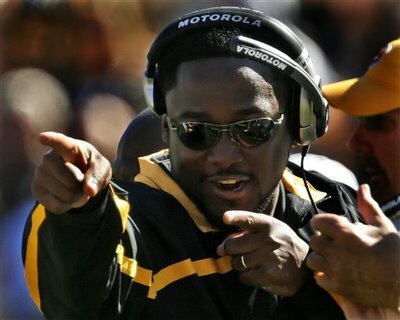 When asked what he thought of his accomplishment, Tomlin cracked a sly smirk, nodded very coolly, and said, “That’s what’s up.” He then lowered his sunglasses for the assembled crowd and flashed them a wink. This entry was posted in Uncategorized and tagged fake news, nfl, super bowl. Bookmark the permalink.